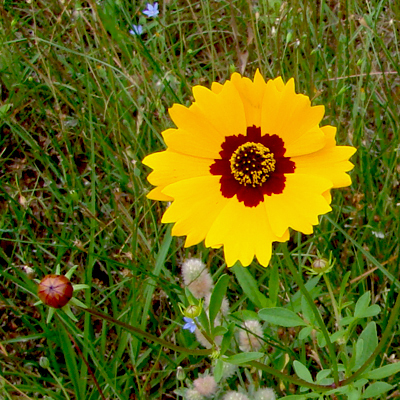 Golden tickseed (Coreopsis tinctoria), also known as Calliopsis or Plains coreopsis, is a native species in the sunflower family. It has potential for use in cultivated gardens and often appears in naturalized prairie, in meadow plantings, and along roadsides. An annual forb that usually germinates in late summer or fall, it overwinters as a rosette (round, low-growing group of leaves). In spring, stems begin branching and can grow to a height of 4 feet. The opposite leaves are deeply divided, with the upper leaf segments being very narrow. Flowering heads are numerous, 1–2 inches in diameter, and are yellow with a red-brown center. The species thrives in most of the United States and grows best in full sun on well-drained soil. Natural stands generally are found in bottomland areas with ample moisture. The 2008 SRS Environmental Report's interactive CD and associated web page were created by Marvin Stewart of the Savannah River Nuclear Solutions (SRNS) Information Technology Department. This year’s cover photograph was made in SRS’s B-Area by Ginger Humphries of SRNS's Regulatory Integration & Environmental Services Department. The cover and CD label were designed by Eleanor Justice of the company’s Records and Document Control Information Section – Information Management and Program Support Group.